Mango pancake (芒果班戟) is one of the most popular desserts in Hong Kong. 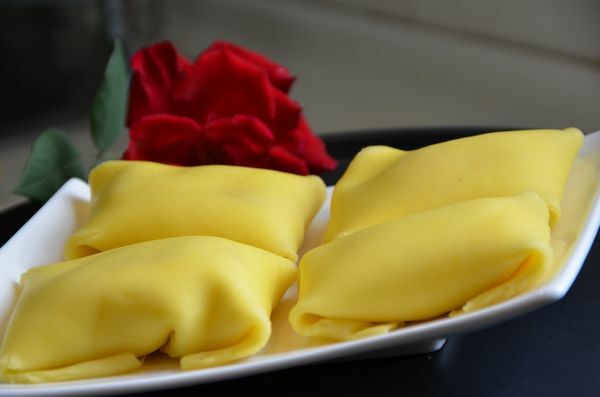 The Mango Crepe combines a delicious Western-style crepe with fresh and delicious tropical mangoes. The sweetness of the mango, the softness of the cream, and the western-style crepe is a fantastic and delicious combination. 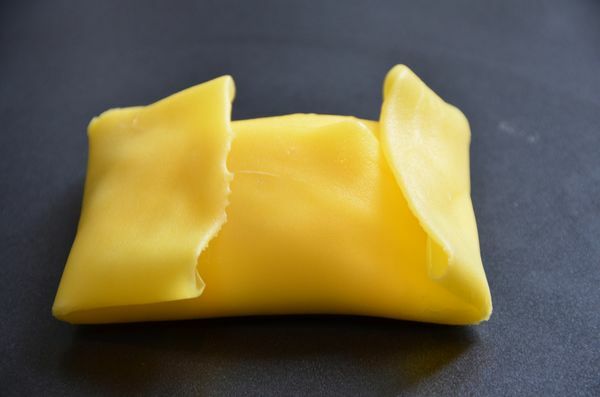 After its integration, mango crepes have become a classic Hong Kong-style dessert. 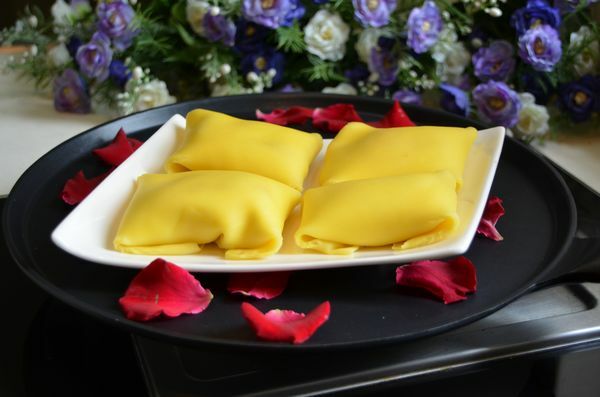 Mango Crepes can be found in many dessert shops in China, but I recommend that you choose some great ingredients, practice at home, and enjoy this dessert whenever you please! This Mango pancake recipe I have formulated is relatively simple to make. Step 1. Beat the eggs in the bowl, add the white sugar, and stir with a whisk. Step 2. Pour in milk and continue to stir to dissolve the sugar completely. Step 4. Stir well with a whisk to a batter until all the flour and corn starch is mixed in. Step 5. Put the butter in a microwave for 5-10 seconds until melted, pour it into the bowl and mix well. Step 9. Pour the Cream and sugar into a bowl, and use an electric egg beater to whip (don’t whip too long, or it will turn into butter…it should look like the image below). How to wrap the filling in pancakes. Step 10. Take a cooled crepe, place the smooth side down, add the preferred amount of cream in the center of the crepe, and place the chopped mango pieces on the cream. Step 11. Fold the surrounding edges to the middle, wrap them into a square shape, then flip them over and place the fold face down. And you are done! If the non-stick pan isn’t that great, use a small amount of butter to grease the pan. Don’t use too much butter. The pan must be preheated, otherwise, the batter can’t be formed quickly. When you pour the batter, the action should be fast. Otherwise, a crepe will be formed quickly. Also, mix the batter a bit every so often, to keep it from seperating. 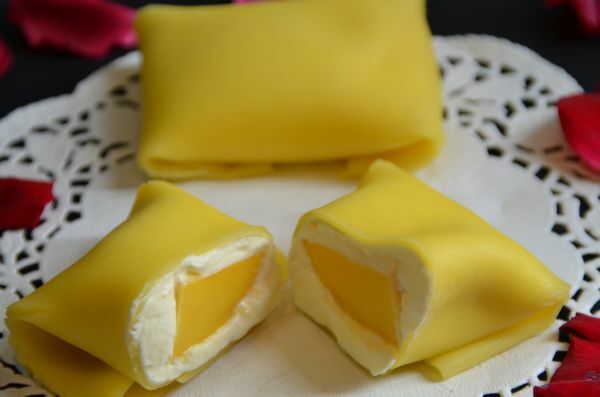 After Mango Crepe is done, it is best to put it back in the refrigerator for setting its shape, otherwise, it will not cut well, and the whipped cream will be better after refrigerating. If you have left over crepes, wrap them with plastic wrap and store in the fridge for up to 3-5 days at most. Except for the mango for garnish, you can also fill them with other fruits like strawberries.